San Francisco was the last stop on our mini tour of California. We were staying in The Mission at Vinnie and Kristine’s place, the most perfect place to stay because Philz Coffee (multi-locational) is just around the corner. 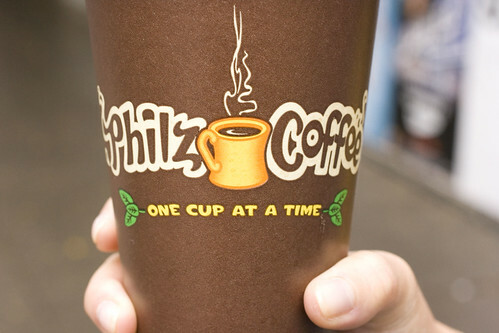 I first tried Philz coffee two years ago, when I was in San Francisco for the Nike Women’s Marathon (and yes I did run it, thank you.) I fell in love instantly because it tastes as good as it smells. (Usually, the flavor doesn’t live up to the alluring aroma.) 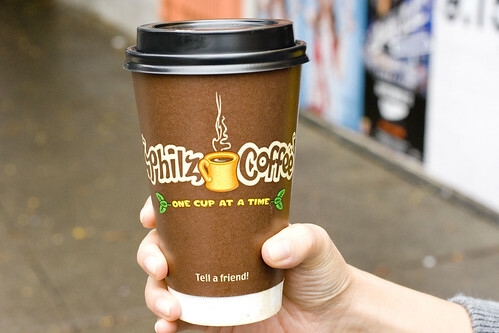 I used to think it must be that they brew one cup at a time, but a few places in NY started doing that, and they still don’t compare to Philz. The first morning, I had their house blend, the Tesora, as good as I remember it. The next morning, I had the Ambrosia, even better. I couldn’t believe it. The flavor is coffee, no extraneous flavors, but it’s so enhanced, like the flavor reaches deeper into your tongue and down into your belly. On the last day, I was going to try another blend, since they have so many, but I couldn’t. I had to have the ambrosia again before we left. I even bought a pound of beans back with me, and it’s very good, but not the same. In our three visits, we observed, trying to figure out their secret. They do grind the beans right when you place your order, then they slam it into the filter. Maybe that packs the grinds a certain way. They pour hot water (probably a precise temperature) through the grinds and it drips into your cup. They don’t even use a coffee machine. They sweeten with brown sugar (if you take sugar) and cream (unless otherwise specified). Whatever their secret is, it’s just perfect every time, and so reasonably priced at $3.25 for a large cup. On Friday, we had a great lunch at Yank Sing, before exploring The Ferry Building. I wish I wasn’t so stuffed already. 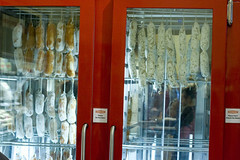 There was so much there that we couldn’t eat, bread, cheese, meats. 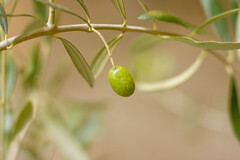 We did taste some olive oils. 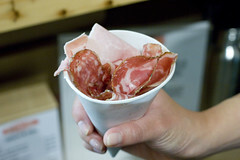 Boccalone offered a small trio of salty meats. We figured we could handle that little portion. Our original dinner plan was Zuni Cafe, but a stroke of bad luck closed them for Friday evening because of an electricity problem. 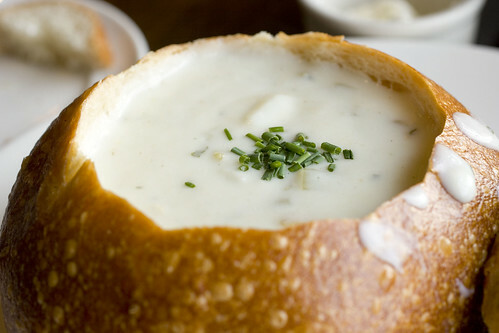 So we headed to Bistro Boudin, at Fisherman’s Wharf, to get a good ole’ San Francisco sourdough bread bowl with clam chowder. Unfortunately, now that we’ve had the best clam chowder, this one paled in comparison, but the bread bowl is still a winner. 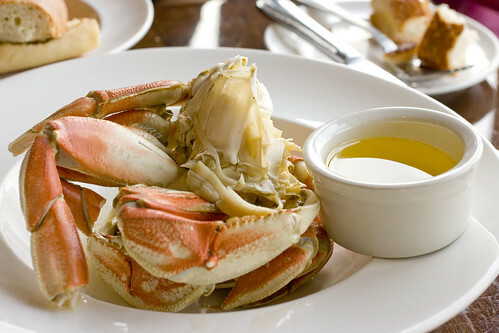 I had the Dungeness Crab, one of the things I really envy the West Coast for. 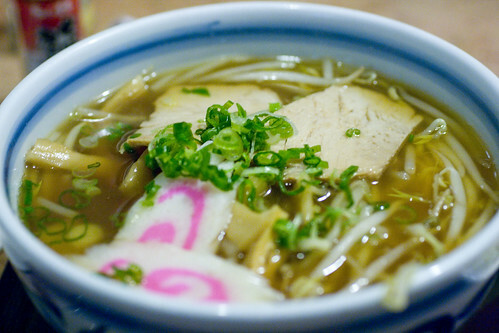 It was fresh and meaty, simply steamed to perfection. Outside, there are several stands selling it for a few dollars less, but at Boudin, you can sit comfortably at a table with napkins and a bathroom nearby. It’s a tad touristy, but I’ll take tourists over cold winds any day. 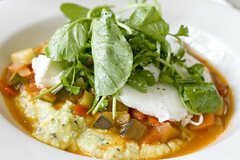 This dish also comes with a standard Caesar salad and Linguine Arrabiata (not spicy at all). It’s very mediocre but rounds out the meal, and I was thankful for a casual dinner at this point. That night, it thundered and rained as we slept, something we hear is rare for SF. Around 4:30am, there was an insane bang that woke everyone up (except me, I sleep like a rock). We heard later on that lightning had blown up a transformer not too far from us. By the time, we got up, it was still raining so we decided on something close by, breakfast at Sun Rise Restaurant 3126 24th Street, San Francisco, CA 94110. It’s a casual Mexican place in The Mission, a good local joint with big portions and less grease than you’d expect. The daytime plan for Saturday, touring two SF Farmer’s Markets, got rained out. I was pretty bummed about that but we settled on a visit to Japantown, not knowing much about it. It turns out, the best thing there is a $1.50 store called Daiso. They’ve got tons of adorable kitchen goodies like plates, bowls, cupcake liners, baking pans, and more. If this place was near me, we’d be in big trouble! We ate lunch in Japantown out of convenience so I assumed it would be pretty bad. All the sushi places seemed to be closed during lunch so we chose ramen. Osakaya 1737 Post Street, San Francisco, CA 94115 really wasn’t as bad as I expected, especially for the price. They have a bunch of different lunch combos but we both got the giant bowl of ramen (one shoyu, one miso) with a mini chirashi for $10.95 each. The pork was really dry but otherwise really decent, only there was a good 5 minutes between my food and Lon’s food coming. That night, we headed to The French Laundry. Sunday morning, we had brunch with Bobby at Universal Cafe 2814 19th Street, San Francisco, CA 94110, where you’ll likely have to wait on line. 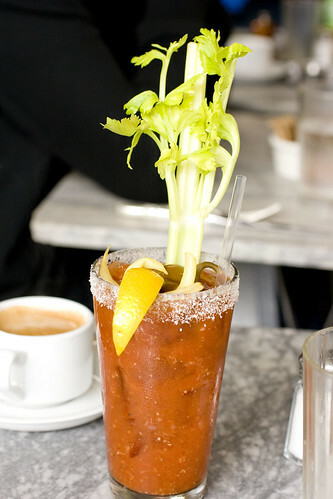 Skip the very watered down shake, but Bobby enjoyed a pretty fancy Bloody Mary. 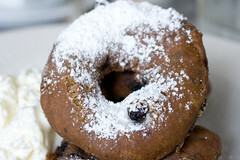 The freshly fried doughnuts are cake doughnuts, but a bit lighter than usual and not too sweet. 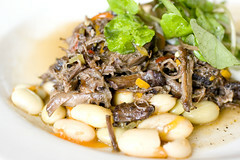 We all enjoyed our entrees whether it was soft poached eggs with polenta and ratatouille or something richer, like short ribs and canneli beans. 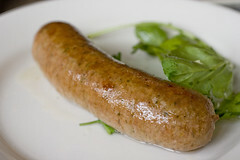 The house-made pork sausage had great straight-up pork flavor but did crumble in a dry-ish sort of way. Overall, if you can wait on-line, it’s a nice fresh start to your morning, especially the waiter who is contagiously happy. I like that they have their own style without being too wild. After-all it is early in the day. Unfortunately, that was our last meal in SF. We had to head back to NY, right into fall weather. Ugh! We had such a great time though, pretty much all the way through. California is way more beautiful than I expected and it’s likely we’ll be back soon. We didn’t get to eat quite all that we wanted yet. Orange County to Napa Valley in ten days is just not enough time. posted by jessica	at 12:28 AM	Filed under Restaurants, Travel. You can follow any responses to this entry through the RSS 2.0 feed. Both comments and pings are currently closed. 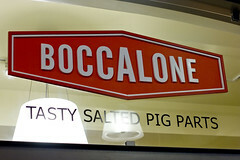 Oh I just saw Boccalone on Food Network’s “The Best Thing I Ever Ate”! 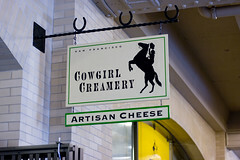 Too bad you didn’t get to sample Cowgirl Creamery! I buy their cheeses in Idaho and it’s fantastic; bet it’s even better fresh. I sent you all chocolates from Cowgirl Chocolates in Moscow, Idaho, so you’ll have a second chance to cowgirl it up! EMC, yee-ha, I can’t wait to try the chocolates! Thank You! What a wonderful eating tour. I love the bread bowl, too. 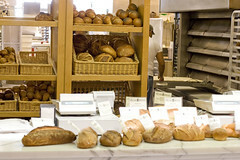 The Ferry Building Plaza is my favorite place in San Francisco, I love everyone one of the merchants! CA is so beautiful, isn’t it? But the weather in SF is HORRIBLE. 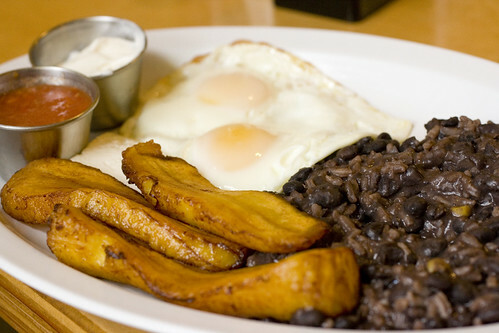 I wish you had more time to explore, because the food there is truly amazing!